A Chakra is any center of the Subtle Body believed to be psychic energy centers in the esoteric traditions of Indian religions. The concept is found particularly in the tantric traditions of Hinduism, Buddhism, and Jainism. They are conceived as an energy focal point, bodily functions or psychic node in the Subtle Body. 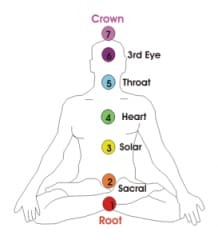 The Chakra theories are elaborate part of the Kundalini system. These theories differ between the Indian religions, with esoteric Buddhist literature mentioning four Chakras, while esoteric Hindu texts state seven. They are believed to be part of the subtle body, not the physical body, and connected by energy channels called Nadi. In the Kundalini version of Yoga, breath exercises focus, in part, on mastering and channeling energy through the Chakras.